NASHVILLE, Tenn. — As an impoverished blind child in Florida, Ray Charles grew up listening to the country and western stars on the Grand Ole Opry broadcasts. That music of his childhood stayed close to his heart for the rest of his career, and it was his landmark two-volume set, "Modern Sounds in Country and Western Music," that changed country music in the '60s. Charles, who died in 2004, will be the subject of a new public television special airing in February. 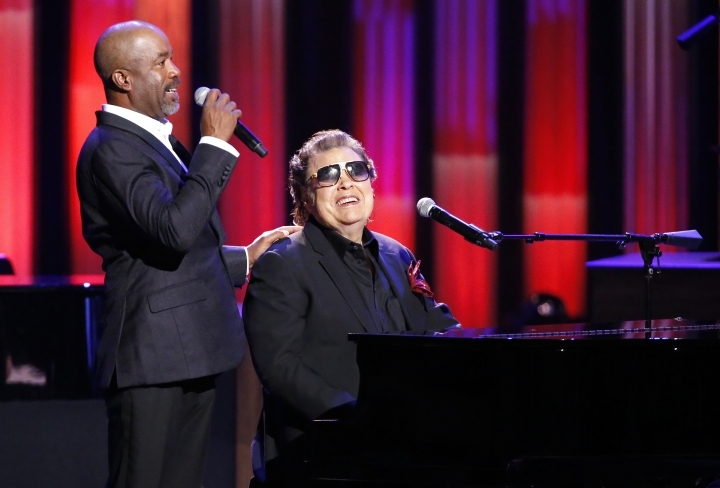 During a special taping Monday at the Grand Ole Opry, a diverse cast of singers, including Darius Rucker, Ronnie Milsap, Charlie Wilson, Boyz II Men, LeAnn Rimes, Cam and more, honored the soul genius. 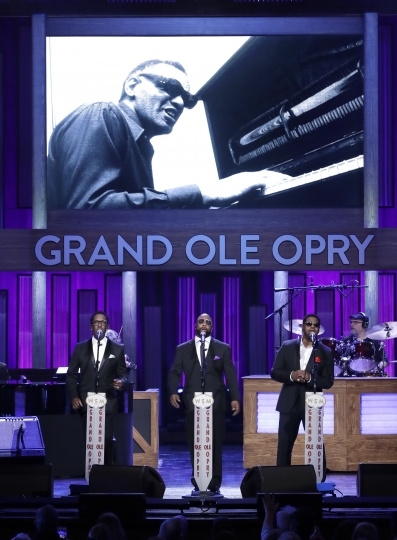 The rare tribute from the country music institution was in partnership with the Ray Charles Foundation, whose president Valerie Ervin said getting the recognition from the Opry was a priority for her. "The Opry meant everything to him. He loved everybody at the Opry," Ervin said. "He loved country music, so to have it here, it just seals it for me. I felt what he felt back in 1962 when he really wanted to be a part of the country world and there was no better place to do it than the Opry." Charles' decision to record a collection of country songs from artists like Hank Williams and Eddy Arnold was good timing for the genre, said Diane Pecknold, professor of women's and gender studies at the University of Louisville. "He came along at a time when the Country Music Association was aggressively working to recast the image of its audience," Pecknold said. "The industry and the popular culture at large tended to view the country music audience as backward hicks, racists, retrograde people generally." Recorded in New York with lush strings and backing choir, Charles doesn't just reinvent the songs, he left his unique mark on them, fusing soul and jazz, country lyrics and orchestral pop. Fifty years later, the album still holds up as one of the greatest of the genre. The record spent 14 weeks on the top of the Billboard albums chart. "I Can't Stop Loving You" spent five weeks at No. 1 on the pop charts and 16 weeks at No. 1 on the R&B charts and won the 1962 Grammy Award for best rhythm and blues recording. The first volume sold more than 1 million records, so a second volume came out shortly after. Country publishing suddenly became in high demand as other artists sought to replicate Charles' success. "He was more successful than anyone in taking country music to pop audiences," said Pecknold. Rucker, who hosted the TV special, said that artists like Charles and Charley Pride were instrumental in his own path to country music. "Ray went out on a limb and took a chance and nobody wanted him to do it," Rucker said. "He did it anyway. It still stands the test of time. And now for some place like the Opry to pay tribute to Ray is huge." Later in the 1980s, Charles would hit the country charts with another album of country songs, "Friendship," including a No. 1 country hit duet with Willie Nelson on "Seven Spanish Angels." The TV special includes a riveting performance of that song by Nelson's son, Lukas Nelson, who shared photos of his dad and Charles from his last birthday. From Travis Tritt's energetic performance of "I'm Movin' On," to Chris Young's version of "I Can't Stop Loving You," the country performers let out their best soulful renditions for the special. Boyz II Men had the daunting task of taking on "Georgia On My Mind," arguably one of Charles' best recordings, and the trio of singers with their harmonic vocal runs did justice to the classic. 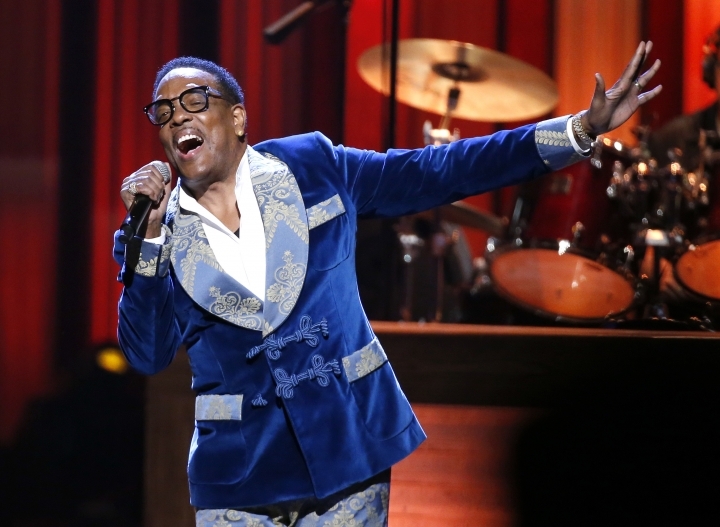 "One of Ray's greatest characteristics is how he is able to take his time and for you to ingest everything that he said," said Shawn Stockman, of the R&B group. "He did exactly what he needed as opposed to trying to do too much." The tribute, 14 years after his death, raises questions about why he has been left out of the Country Music Hall of Fame. Most of the performers on the special believe he deserves a spot among the country legends for exposing the genre to a much broader world. "I would never tell the Country Music Hall of Fame who to put in, but I think all the artists, if they let Ray in, they would understand and believe that Ray should be there," Rucker said. Ervin said that Charles did say that he wanted to be inducted into the Country Music Hall of Fame, but he was proud of his work in the genre no matter what. "His attitude was, 'I know what I did for the country music world, so if I am never in there, I am OK,'" Ervin said.